There is a high incidence of gingivitis in pregnant women due to combined effect of local and systemic factors. Chlorhexidine is an effective chemical plaque control agent by virtue of its property substantivity. Aim and Objective: In the present work we propose to study the effect of 0.2% chlorhexidine gluconate solution as a mouth rinse on gingival inflammation in pregnant women in comparison with non-pregnant women, before and after scaling and polishing procedures. Materials and Methods: A total number of seventy six healthy pregnant and non pregnant females in the age group of 20 to 30 years were included for the study. All the subjects used 0.2% chlorhexidine gluconate mouthrinse twice a day for 3 weeks. Weekly observations were made in both subgroups. Results: There was no significant reduction in plaque index, papilla,marginal gingiva and attached gingiva index and gingival bleeding index when 0.2% chlorhexidine gluconate mouth rinse was used alone without scaling and polishing procedures. When 0.2% chlorhexidine gluconate mouthrinse was used after scaling and polishing procedures at the end of 3 weeks, there was highly significant reduction in PMA index and gingival bleeding index in nonpregnant women group, whereas in pregnant women group there was only a significant reduction in the gingival bleeding index. Conclusion: 0.2% chlorhexidine gluconate used as mouth rinse twice a day for three weeks reduces gingival inflammation and gingival bleeding in both pregnant and non pregnant women, but significantly more in non pregnant women. Theilade et al (1980) has shown that chemical agents make plaque control easier or more efficient. The most successful and widely used antiplaque agent is biguanide chlorhexidine, which has been used in the form of a topical application toothpaste and mouth rinse in appropriate concentration. ,,, It is also stated that chlorhexidine controls dental plaque under conditions where other many bactericides fail. Chlorhexidine is effective in control of dental disease by virtue of adsorption by oral surfaces, from where it slowly releases and thus exerts a prolonged bactericidal effect. There is high incidence of gingivitis in pregnant women due to a combined effect of local and systemic factors. Also, there is a possibility of having more effective plaque control by using these chemical agents. Therefore, in the present study, it is proposed to study the effect of 0.2% chlorhexidine gluconate solution when used as a mouth rinse, on the gingival inflammation in pregnant women before and after scaling and polishing procedures. Group A: 20 non pregnant females were instructed to rinse their mouth twice a day with 10 ml of 0.2% chlorhexidine gluconate solution 2 days after the completion of scaling and polishing procedures. Group B: Eighteen non pregnant females who had not undergone scaling and polishing procedures were instructed to rinse their mouth twice a day with 10 ml of 0.2% chlorhexidine gluconate solution. Group C : Twenty pregnant females were instructed to rinse their mouth twice a day with 10 ml of 0.2% chlorhexidine gluconate solution 2 days after the completion of scaling and polishing procedures. Group D : Eighteen pregnant females who had not undergone scaling and polishing procedures were instructed to rinse their mouth twice a day with 10 ml of 0.2% chlorhexidine gluconate solution. On the first day, each subject was examined and the detailed history and the observations regarding calculus index, plaque index, PMA index and gingival bleeding index were recorded. Supra and subgingival scaling and polishing with root planning procedures were completed in all subjects included in groups A and C. Two days after the scaling and polishing was completed, the clinical observations like plaque index, PMA index and gingival bleeding index were re-recorded. The subjects included in groups B and D were not treated though the observations were made. All subjects included in groups A, B, C and D were asked to use 10 ml of 0.2 percent chlorhexidine gluconate as mouth rinse twice a day. For each group, plaque index, PMA index and gingival bleeding index and other observations regarding staining, acceptability etc. were recorded at the end of every week. Total period for study consisting the use of 0.2 percent chlorhexidine gluconate as a mouth rinse was for 3 weeks. The observations made were recorded separately for each subject. During the study, the oral hygiene habits were not changed at all, and the subjects were allowed to use the same method and devices as they had previously. None of the subjects received any type of antibiotic 2 months before and during the study. The females from pregnant group were selected at random from different trimesters [Table 1]. Pregnancy was confirmed by department of Obstetrics and Gynaecology, Government Medical college. All the patients were examined under the same conditions with the same instruments and by the same operator throughout the study. 0.2% chlorhexidine gluconate solution in a pleasantly flavored aqueous base with colors of sunset yellow, FCF, Panceau 4R, brilliant blue FCF Supra, from ICPA health products Pvt. Ltd. Ankleshwar (Gujrat) was used throughout the study for all participants. At the end of the 1 St],[ 2 nd and 3 rd weeks, the plaque Index (Silness and loe), papillary marginal attachment Index (schour and Massler) and gingival Bleeding Index (Ainamo and Bay) were recorded. The results obtained in various groups were tabulated, calculated and subjected to statistical analysis. The comparison of various groups was carried out by p test and levels of significance were found out. The plaque index reduced significantly after scaling and polishing procedures in all subjects. The plaque index reduced further gradually in all groups after using.0.2% chlorhexidine gluconate mouth rinse twice a day [Table 2]. Gingival inflammation as recorded by PMA index reduced after scaling and polishing procedures in all subjects. There was a slight reduction in the gingival inflammation as recorded by PMA index after using 0.2% chlorhexidine gluconate mouth rinse in subjects who had not undergone scaling and polishing. The gingival inflammation recorded by PMA index [Figure 1] and gingival bleeding index [Figure 2] was reduced significantly in non pregnant women as compared with pregnant women after scaling and root planning procedures and using 0.2% chlorhexidine mouth rinses. However changes in plaque index scores were statistically insignificant. There was no significant reduction in plaque index [Figure 3], PMA index and gingival bleeding index when only 0.2% chlorhexidine gluconate mouth rinses were used without undergoing scaling and polishing procedures. When 0.2% chlorhexidine gluconate mouth rinses were used after SRP, at the end of 3 weeks there was highly significant reduction in PMA index and gingival bleeding index in non pregnant women group whereas in pregnant women group there was only significant reduction in gingival bleeding index. It was observed in the present study that the plaque index, gingival bleeding index and PMA index decreased significantly after supra and subgingival scaling with root planning procedures when compared with untreated subjects. It was also observed that although the plaque score was greatly diminished it did not disappear altogether. This has been observed by Brayer et al. There was highly significant reduction in PMA scores on rinsing mouth with 0.2% chlorhexidine at the end of three weeks in both pregnant and non pregnant groups who had undergone scaling and polishing. 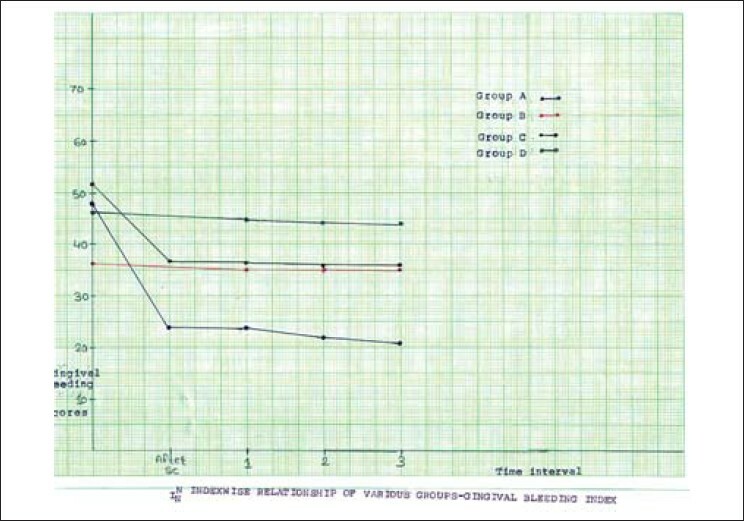 In groups where chlorhexidine gluconate mouthrinse was used alone without scaling and polishing, the PMA scores were reduced insignificantly. The use of chlorhexidine without SRP showed limited reduction in PMA. Also, from the results it was observed that the scaling and polishing procedures reduced plaque, PMA and gingival bleeding scores in both pregnant and non pregnant subjects. The 0.2% chlorhexidine gluconate mouthrinses showed limited reduction in PMA and gingival bleeding index when SRP was not done [Table 3] and [Table 4]. However there was reduction in plaque scores. In the various studies conducted, the chlorhexidine has been following SRP only. In the present study it was observed that at the initial examination the calculus was covered with plaque but following the use of chlorhexidine gluconate mouthrinses plaques was not observed on the calculus to the same extent as was observed earlier. The present study shows that though the plaque score is reduced effectively in untreated subjects following 0.2% chlorhexidine mouth rinses there was no significant reduction in PMA and gingival bleeding index. This observations though made in small samples indicate that the presence of calculus with minimal plaque is also responsible for gingival inflammation and gingival bleeding, whereas the role of plaque has been accepted universally as the main local irritant for gingival inflammation. The reduction in plaque scores were observed in both pregnant and non pregnant groups but the non pregnant group showed more reduction in PMA and gingival bleeding index scores as compared to pregnant group, following use of 0.2% chlorhexidine gluconate as mouthrinse. This observation of persistence of gingival inflammation and gingival bleeding to a greater extent in pregnant group, when compared with non pregnant group indicates that in addition to local factor some systemic factor is also actively associated in pregnant women, may be hormonal influence. Out of various oral hygiene aids, the use of tooth brush is advocated all over the world. In this study the subjects were asked to continue the same oral hygiene habit. The half number of subjects out of total were pregnant women selected at random with varying degrees of gingival inflammation and most of them had bleeding from gingiva due to aggrevated conditions resulting into lack of home oral hygiene care. Observation made by Chiodo and Rosenstein  the fright of increase in gingival bleeding to which the pregnant women are more prone tend them to modify the oral hygiene habits followed by them prior to pregnancy. Also the subjects would have taken longer time in adapting proficiency in new oral hygiene method. In pregnant women, their availability for participation in study was limited especially of subjects of third trimester. 1. Carranza FA. TB Glickman Clinical Periodontology. 5 th ed. Chap. 6. Philadelphia: Saunder's Publication; 1979. p. 81. 2. Cohen DW, Friedman L, Shapiro J, Kyle GC. A longitudinal investigation of the periodontal changes during pregenancy. 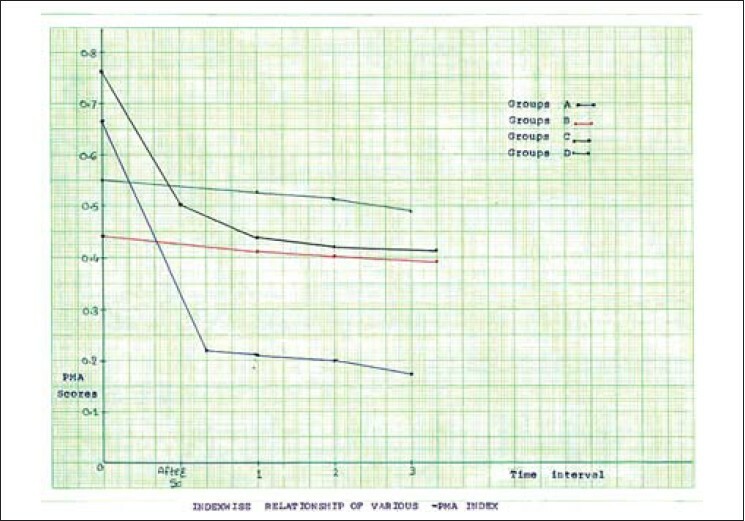 J Periodontal 1969;40:563-70. 3. Loee H. Periodontal changes in pregenacy. 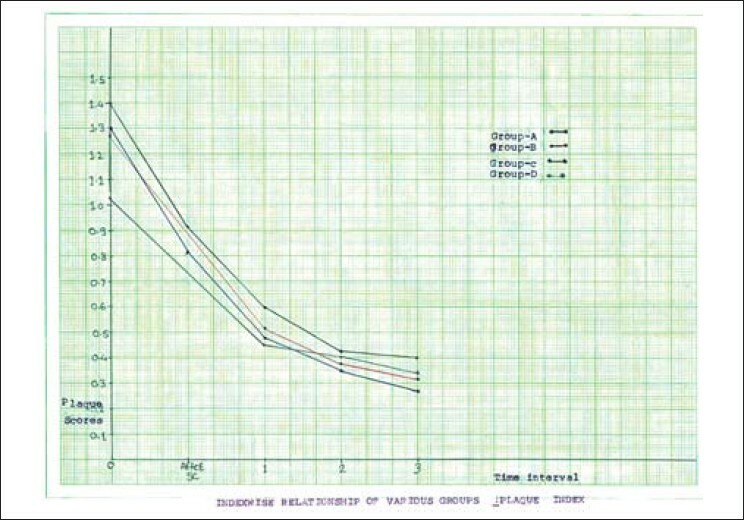 J Periodontol 1965;36:209-17. 4. Cancro LP, Paulorich DB, Klein K. Effect of Chlorxidine gluconate mouthrinsed on dental plaque and Calcus. J Periodontol 1972;43:687-91. 5. Theilade G. Dental Plaque inhibition by some chemical agents A review Journal of Indian society of periodontology 1980;4: 18-20 Hall PS. Chemical inhibilition of plaque Review articles. J Clin Periodontol 1980;7:431-42. 6. Nagle PJ, Turnball RS. Chlorhexidine: A ideal plaque inhibiting Agent. Can Dent Assoc 1978;44:73-8. 7. Roberts WR, Addy M. Comparison of the in vivo and invitro antibacterial properties of antiseptic mouthrinses containing chlorhexidine, Alexidine, Cetyl Pyridinium chlorxide and Hexatidine - Relevance to Mode of Action. J Clini Periodontol 1981;8:295-310. 8. Case DE. Safety of Hibitance Laboratory experiment. J Clinical Periodontol 1977;4:66-72. 9. Sharr E. The menopause. Acad Med 1940;16:453-74. 10. Chiodo GT, Rosenstein DI. Dental treatment during pregnancy: a preventive approach. J Am Dent Assoc. 1985 Mar;110: 365-8.